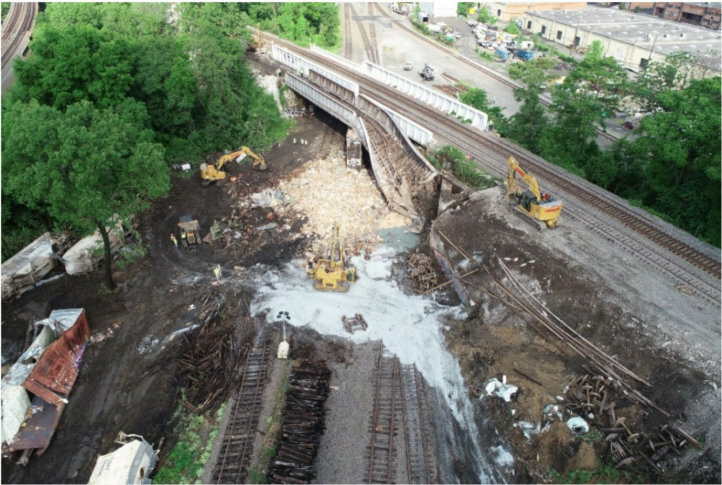 WASHINGTON — Last month’s CSX derailment, which sent freight cars plunging off a bridge in Alexandria onto another track, appears to have been caused by heavy rains washing out the rocks supporting the track, a preliminary National Transportation Safety Board report suggests. An overhead drone photograph shows what looks like a sinkhole under the side of the concrete ties holding one of the rails at the spot where most of the 31 derailed cars left the tracks, matching what the train crew had described in initial interviews as a “spongy” condition. 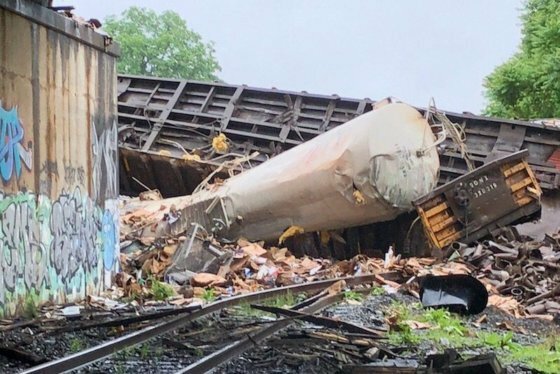 The NTSB’s preliminary report provided Monday on the May 19 derailment shows a 26-foot stretch of a curve under the nearly two-mile freight train appeared to be largely unsupported. There had been heavy rain and thunderstorms in the days and hours leading up to the derailment — five and a half inches of rain over the preceding 10 days. The rocks sat a foot and a half lower than they should have, and a mark on the rail showed that area was where cars slid off the tracks parallel to the Capital Beltway east of the Van Dorn Street Metro station. Photos from the May 19 derailment of the CSX train in Alexandria. Investigators will now focus on the root causes of the incident, and ways to prevent something like it in the future. They are checking the signal systems, track and engineering problems, and any possible mechanical or equipment problems. Investigators have also interviewed the train crew and other CSX employees. Damage is estimated at up to $7 million. It includes extensive damage to the bridge, which appears to have twisted down as cars fell to the ground below. The southbound train to Rocky Mount, North Carolina, with three locomotives and 167 cars (76 of them empty, none carrying hazardous materials) was going about 38 mph when the 42nd through 66th cars derailed. The 89th through 94th cars derailed a bit farther down the tracks. No one was hurt. The track where the train derailed runs on a separate bridge from two other parallel tracks in the area, so those CSX tracks were able to remain open following the Sunday, May 19, derailment. That has reduced the impact of the derailment on freight traffic and commuters on Amtrak or Virginia Railway Express trains. Norfolk Southern, the railroad that operates the tracks the freight cars fell onto from the CSX bridge, has also worked to repair its own tracks.